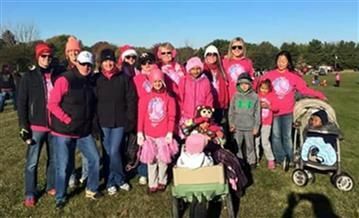 Associated Bank colleagues in Rockford and Machesney Park, Illinois, recently braved the cold and joined other community members to walk three miles in support of the American Cancer Society’s annual Making Strides Against Breast Cancer event. Surrounding branches showed their support and dedication by purchasing pink Associated Bank shirts and encouraging staff and clients to make donations in exchange for pink ribbons to add onto their Wall of Hope. Nearly 200 ribbons were handed out, with generous donations ranging from $1 and up. The Bank sponsored $500 for the mile marker, dedicated over 20 colleagues and friends to walk in the event, and enhanced the community outreach from the branches. Associated Bank’s team raised a total of $1,400 for the cause, in addition to the $206,840 raised by American Cancer Society overall. Photo caption: Associated Bank colleagues, family and friends come together to take a stride against breast cancer.